Indulge in a gourmet meal at Tropics. Enjoy rich hardwoods, granite countertops, and tropical decor. Kids could spend a few hours everyday on the waterslides. 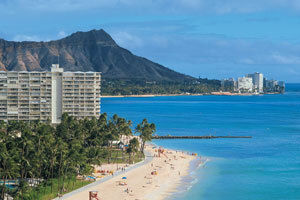 You have Waikiki Beach and the protected waters of a lagoon. There are fun waterslides, kids activities, and a lagoon stocked with kayaks, floaties, and more. The Grand Waikikian by Hilton Grand Vacations is located within the twenty-two-acre Hilton Hawaiian Village Beach Resort & Spa. Picture elegant high rise towers, a huge palace-like lobby, sunset dining, and even your own private salt water lagoon surrounded by a sandy beach and stocked with paddle boats, kayaks, and the ever-present floppy foam noodle. Waikiki Beach runs right up against the resort where you can body surf or grab an outrigger canoe and put family team work to the test. If the beach isn’t your style, check out the pools on-site. There are four pools with three waterslides. Be prepared to spend hours in the water, or lounge poolside and work on your sun kissed look while the kids splash around in the children’s pool. Don’t forget to apply sunscreen! Little ones will love the activities at the Camp Penguin Program. While they are occupied at Camp, treat yourself for a vacation well-planned with a facial, massage or body scrub at Mandara Spa. It also features a full-service salon if you’re ready for a new look. One- and two-bedroom condos sleep four to six guests and have ocean, partial ocean or city views. Two- and three-bedroom penthouses sleep eight guests. Visit the on-site convenience store or take a family field trip to the Don Quijote Honolulu to stock your full kitchen. Recruit the kids to help bake your famous sugar cookies (and bring cookie cutters from home so they can make them into fun shapes). Don’t feel like cooking dinner? No problem, there are two restaurants on-site to choose from. Flatscreen TVs have premium cable channels HBO, CNN and ESPN. Gather everyone on the couch with blankets, pop some popcorn and get ready to laugh. Be sure to pack some of your favorite movies from home or browse the selection of DVDs available for rent at the resort, DVD players are perfect for family movie night. You’ll also have an in-suite PlayStation 3 (game rentals are available at the resort). Waikiki Beach is just a short walk from The Grand Waikikian by Hilton Grand Vacations and offers a calm swimming area that has a protected seawall. Surprise the kids with trips to the Honolulu Zoo or the Waikiki Aquarium. The forty-two acre Honolulu Zoo features a variety of animals. See various frog and toad species, Two-Toed Sloths, Zebra, Ring Tailed Lemur, Komodo dragons, Aardvark, American Alligators and more. The Waikiki Aquarium has Invertebrates, Fish, Reptiles and Marine Mammals. Invertebrates include Anemones, Coral, Sea Stars, Sea Urchin and Lobsters. Check out the Angel Fish, Butterflyfish, Eels and Damselfish. Green Sea Turtle and Yellow-Bellied Sea Snake are the reptiles, and Marine Mammals include Hawaiian Monk Seals.